Many women are plagued with oily scalp and hair. 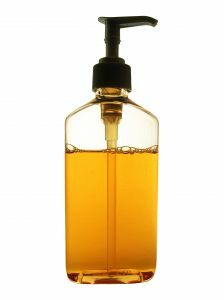 Greasy hair is caused by excess production of sebum which is the skins natural oils. Certain essential oils like rosemary, sage, teatree, lemon and herbs such as Lemongrass, lavender, mints, rosemary, southernwood, witch hazel and yarrow are well known to help regulate sebum production. One of the main causes of excess sebum production is over shampooing. As a stylist,I tell my clients countless times there is no need to shampoo every day. It is so bad for the health of your hair and your artificial hair color! Here's the gist... when you over shampoo, you are causing the scalp to replace the sebum. The more you shampoo... the more sebum the skin creates. Now, slowing down on your shampoo routine all of a sudden isn't going to cure your greasy scalp problem. But it will in time. Usually around 3 weeks. Your scalp has to get used to your new routine. 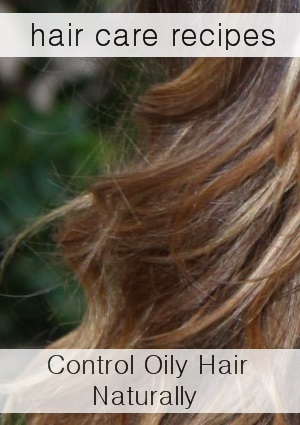 So stick the hair up in a ponytail and with time, you'll control the oil and cure the problem. Lemon juice with its acidic properties, helps to balance an oily scalp and is effective at removing some of the sebum buildup. Try using it as a final build up remover rinse after you shampoo. See our Hair rinse recipes section for more ideas. Herbs. You can use fresh herbs to create a final hair rinse to control oil and bring the natural ph balance back to hair. Check out our hair rinse recipe section to learn how to make hair rinses. Dry Shampoo. Not just for the elderly! Dry shampoos are just powder applied to the scalp. These powders absorb the excess oil. Using a dry shampoo is a GREAT way to control the grease when trying to cut back on regular shampooing. Also really nice for very, very oily hair that looks slick at the end of the day and when you need to freshen and add bounce back to your hair. Simply take the powder, sprinkle the roots, leave on for 2-5 minutes and brush out. If you're at home blowdry hair to remove any excess. You may also find making your own shampoo for oily hair useful. If using essential oils in your dry shampoo recipe, take 1 cup powder and 3 drops of your favorite essential oil. Add EO to powder in a zip lock bag. shake well, let sit overnight then use as above.